Chapter 2: Programming Models for Multicore and Many-Core Computing Systems. One of the top 50% most downloaded eBooks in the relevant Springer eBook Collection in 2012, 14.000 downloads from 2012-2014. Jungle Computing: Distributed Supercomputing beyond Clusters, Grids, and Clouds. Grids, Clouds and Virtualization, pp. 167-197, Springer-Verlag, 2011. Programming Multi-core and Many-core Computing Systems, Wiley Series on Parallel and Distributed Computing 6079, John Wiley & Sons, 2011. Chapter 24 by Henri Bal, Henri Casanova, Jack Dongarra, and Satoshi Matsuaka. Section 24.5, pp. 478 – 482: Satin Case Study. 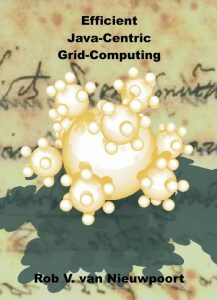 One of the most influential books on grid computing, often referred to as “the grid bible”. eScience development and experiences in The Netherlands. Informatik Spektrum, DOI: https://doi.org/10.1007/s00287-018-01132-3, 2018. Manifesto from Dagstuhl Perspectives Workshop 16252, vol 6, no 1, Schloss Dagstuhl–Leibniz-Zentrum fuer Informatik, Dagstuhl, Germany, doi:10.4230/DagMan.6.1.1, 2017. Using modular 3D digital earth applications based on point clouds for the study of complex sites. International Journal of Digital Earth, ISSN: 1753-8947 (Print) 1753-8955 (Online), DOI: 10.1080/17538947.2016.1205673, July 2016. The Landscape of GPGPU Performance Modeling Tools. Parallel Computing, volume 56, number C, pages 18-33, doi: 10.1016/j.parco.2016.04.002, August 2016. Real-Time Dedispersion for Fast Radio Transient Surveys, using Auto Tuning on Many-Core Accelerators. Astronomy and Computing, Volume 14, January 2016, pages 1-7, DOI:10.1016/j.ascom.2016.01.001. The Square Kilometre Array Science Data Processor Preliminary Compute Platform Design. Journal of Instrumentation, Volume 10, July 2015. A Medium-Scale Distributed System for Computer Science Research: Infrastructure for the Long Term. IEEE Computer, vol.49, no. 5, pp. 54-63, doi:10.1109/MC.2016.127, May 2016. Stepwise-refinement for Performance: a methodology for many-core programming. Concurrency and Computation: Practice and Experience , Volume 27, Issue 10, 2015. DOI: 10.1002/cpe.3416. Discovery of carbon radio recombination lines in absorption towards Cygnus A. Monthly Notices of the Royal Astronomical Society, Volume 437, Issue 4, Pages 3506-3515, Feb 2014. Detecting cosmic rays with the LOFAR radio telescope. Astronomy & Astrophysics, 560 (2013) A98. Monthly Notices of the Royal Astronomical Society, 2013. Astronomy and Astrophysics 556, 2013. Parallel Computing, Volume 38, Issues 1-2, Pages 75-89, January-February 2012. Concurrency and Computation: Practice & Experience, 23(13):1506-1521, DOI: 10.1002/cpe.1713, September 2011. Concurrency and Computation: Practice & Experience, 23(1):17-37, January 2011. Springer International Journal of Parallel Programming, Special Issue on NY-2009 Intl. Conf. on Supercomputing, Volume 39, Number 1, 88-114, DOI: 10.1007/s10766-010-0144-3, 2011. IEEE Signal Processing Magazine, Volume 27 Number 2, march 2010 issue on Signal Processing on Platforms with Multiple Cores: Part 2 — Design and Applications, pp 108-117, 2010. IEEE Computer, 43(8): 54-62, August 2010. NOTE: The printed version of this paper has a mistake in the title: “Computer” should be “Computing”. ACM Transactions on Programming Languages and Systems (TOPLAS), Volume 32 Issue 3, ACM Press New York, NY, USA, 2010. DOI: 10.1145/1709093.1709096. Scientific Programming, Volume 17, number 1, pp. 113-134, DOI 10.3233/SPR-2009-0276, Special Issue on High Performance Computing on the Cell BE, 2009. Parallel processing of large datasets from nanoLC-FTICR-MS measurements Journal of the American Society for Mass Spectrometry, Volume 18, Issue 1, January 2007, pp. 152-161, 2007.
International Journal of High Performance Computing Applications, volume 20, number 1, pp. 103-114, ISSN 1094-3420, spring 2006. Proceedings of the IEEE, Vol. 93, No. 3, pp. 534-550, March 2005. Future Generation Computer Systems, Vol. 18, No. 8, pp. 1113-1125, 2002. Vrije Universiteit Amsterdam, Faculty of Sciences, March 2000. Volume 23, Issue 6 (November 2001), pp. 747 – 775. ACM Special Interest Group, Operating Systems Review, Vol. 34, No. 4, p 76-96, October 2000. Proceedings of the Workshop on Sustainable Software for Science: Practice and Experiences (WSSSPE5.1). University of Manchester, Manchester, UK, 6 September 2017. DOI: 10.6084/m9.figshare.c.3869782. CF’17 Proceedings of the Computing Frontiers Conference, Pages 263-266, Siena, Italy — May 15 – 17, 2017. Towards exascale real-time RFI mitigation. Proceedings of 2016 Radio Frequency Interference (RFI2016) Coexisting with Radio Frequency Interference, Socorro, New Mexico, USA, Pages 69-74, October 2016. DOI: 10.1109/RFINT.2016.7833534, Electronic ISBN: 978-1-5090-6201-0, Print on Demand ISBN: 978-1-5090-6202-7. Lightning talk: Software Impact Measurement at the Netherlands eScience Center. Proceedings of the Fourth Workshop on Sustainable Software for Science: Practice and Experiences (WSSSPE4), volume 1686, Manchester, United Kingdom, 2016. Lightning Talk:”I solemnly pledge”. A Manifesto for Personal Responsibility in the Engineering of Academic Software. A Tool for Bottleneck Analysis and Performance Prediction for GPU-accelerated Applications. The Sixth International Workshop on Accelerators and Hybrid Exascale Systems(AsHES). A Real-Time Radio Transient Pipeline for ARTS. IEEE Global Conference on Signal and Information Processing (GlobalSIP), IEEE Signal Processing Society. Held in Orlando, Florida, USA, December 14-16, 2015. 11th IEEE International Conference on eScience, Munich, Germany Aug 31 – Sept 04, 2015. 29th IEEE International Parallel & Distributed Processing Symposium (IPDPS 2015), 25-29 May 2015, Hyderabad, India. DOI: 10.1109/IPDPS.2015.38. Twelfth International Workshop on Algorithms, Models and Tools for Parallel Computing on Heterogeneous Platforms (HeteroPar’2014) August 25, 2014, Porto, Portugal. L. Lopes et al. (Eds. ): Euro-Par 2014 Workshops, Part I, LNCS 8805, pp. 165–176. Springer International Publishing Switzerland, 2014. 28th IEEE International Parallel & Distributed Processing Symposium (IPDPS), pages 952-961, DOI:10.1109/IPDPS.2014.101, Phoenix, USA, May 2014. Engbersen, Ton, Boonstra, A., Anghel, A., Broekema, C., Dangel, R., van Diepen, G., Dittmann, G., Doering, A., Hagleitner, C., Holties, H., Horst, F., Hurley, P., Iliadis, I., Jelitto, J., Jongerius, R., Kim, Y., Luijten, R., van Lunteren, J., Maat, P., van Nieuwpoort, R. Nijboer, R., Offrein, B., Paredes, S., Ratcliffe, S., Romein, J. W., Sarafijanovic, S., Schmatz, M., Schoonderbeek, G., Venkatesan, V., Weiss, J., Wijnholds, S. J. Programming Many-Cores on Different Levels of Abstraction. HotPar ’13 Proceedings of the 5th USENIX Workshop on Hot Topics in Parallelism (Poster presentation), July 2013. The 5th International Conference on Safety and Security Engineering, 17 – 19 September, 2013, Rome, Italy. Alessio Sclocco, Rob V. van Nieuwpoort. Facing the Multicore-Challenge III, September 19-21, 2012, Stuttgart, Germany. Lecture Notes in Computer Science Volume 7686, 2013, pp 123-124. Proceedings of the 2012 workshop on High-Performance Computing for Astronomy (AstroHPC’12), Delft, the Netherlands, June, 2012. 26th IEEE International Parallel & Distributed Processing Symposium (IPDPS) May 21-25, 2012, Shanghai, China. URSI General Assembly and Scientific Symposium (URSI GASS’11), Istanbul, Turkey, August, 2011.
in conjunction with 25th IEEE International Parallel and Distributed Processing Symposium (IPDPS) Anchorage, Alaska, USA, 2011. ACM Symposium on Principles and Practice of Parallel Programming (PPoPP’10), Bangalore, India, pp. 169-178, January, 2010. Proceedings of the ACM International Conference on Supercomputing (ICS’09), pp. 440-449, June 8-12, 2009, Yorktown Heights, New York, USA. Rated as one of the top six papers in the conference. Download example software correlator code on different many-core platforms here. In zip format or tgz format. Proceedings of the ACM International Conference on Computing Frontiers, pp. 207-216, ACM Press, May 18-20, 2009, Ischia, Italy. Ibis: Real-World Problem Solving using Real-World Grids. 23rd International Parallel & Distributed Processing Symposium (IPDPS 2009) – Sixth High-Performance Grid Computing Workshop (HPGC 2009), Rome, Italy, May 25-29, 2009. Lyon, France, May 19-22, 2008. Proceedings of the ACM/IEEE Conference on Supercomputing (SC’07), November 2007, Reno, NV, USA. pages 147-158, ISBN: 978-1-59593-673-8, DOI:10.1145/1272366.1272386, Monterey, CA, USA, June 2007. IEEE Sixth International Workshop on Global and Peer-2-Peer Computing, may 2006.
workshop in conjunction with the 15th International Symposium on High Performance Distributed Computing (HPDC-15) June 19 2006, Paris. in Proceedings of the CoreGRID Workshop on Integrated Research in Grid Computing, S. Gorlatch and M. Danelutto (Eds. ), published by Springer-Verlag, 27-30 November 2005, Pisa, Italy. AGridM 2004 Workshop on Adaptive Grid Middleware, September 30, 2004, Antibes Juan-les-Pins, France. Workshop on Grid Application Programming Interfaces, held in conjunction with GGF12, Brussels, Belgium, September 2004. An simple and efficient fault tolerance mechanism for divide-and-conquer systems. IEEE International Symposium on Cluster Computing and the Grid, 2004 (CCGrid), 19-22 April 2004. September 28, 2003, New Orleans, Louisiana, USA. pp. 18-27, November 3-5, 2002, Seattle, Washington, USA. Efficient Load Balancing for Wide-area Divide-and-Conquer Applications. pp. 34-43, Snowbird, UT, June 18-19, 2001. Proc. Euro-Par 2000, pp. 690-699, Munich, Germany, August 29 – September 1, 2000. Proc. 1st European GRID Forum Workshop, pp. 341-348, Poznan, Poland, April 12-13, 2000. Proc. Extreme Linux Workshop, pp. 20-24, Monterey, CA, June 8-10, 1999. Proc. ACM 1999 Java Grande Conference, pp. 8-14, San Francisco, CA, June 12-14, 1999.
pp. 173-182, Atlanta, GA, May 4-6, 1999. Technical Report IR-450, Vrije Universiteit Amsterdam, September, 1998. Live demonstration at the International Symposium on High Performance Distributed Computing (HPDC 2008), Boston, Ma, USA, June 23-27, 2008. 1st IEEE International Scalable Computing Challenge (SCALE2008), held in conjunction with the 8th IEEE International Symposium on Cluster Computing and the Grid (CCGrid 2008), Lyon, France, May 19-22, 2008. Grids@work event in Sophia Antipolis, France, October 2005. First prize for the largest number of parallel nodes deployed during the contest. Removing Radio Frequency Interference in the LOFAR using GPUs. Acceleration of calculation of Third Party Risk around an airport using OpenCL. Supervision shared with Roalt Aalmoes (NLR). Auto-tuning a LOFAR radio astronomy pipeline in JavaCL. A Polyphase Filter For GPUs And Multi-Core Processors. Stichting Astron, Research & Development, 2011. Radio astronomy beam forming on GPUs. Radio frequency interference mitigation for software telescopes. University of Warsaw, Faculty of Mathematics, Computer Science and Mechanics, 2010. Visualization support for Ibis runtime systems and Grid applications. Monitoring and management support for Ibis runtime systems and Grid applications. Extending the Java Grid Application Toolkit to Globus Web Services. A Flexible and Efficient Message Passing Platform for Java. The usability of Java for developing parallel applications. Parallel Programming in Java: Porting a Distributed Barnes-Hut Implementation. Article in the Volksrant (Dutch) about Big Data in astronomy: Het almaar groeiende datamonster: Help, de wetenschapper verzuipt! Martijn van Calmthout, Bard van de Weijer, 29 oktober 2016. Interview about many-core research and LOFAR by journalist Aad Offerman, 2010. Gridforum Nederland Nieuwsbrief, Nr. Augustus 2008. CoreGrid Newsletter, “In the Spotlights”, Nr. 9, July 2008. Gridforum Nederland Nieuwsbrief, Nr. Juni 2008. Interview over mijn promotie onderzoek door journalist Hein van Steenis, 2004. Master’s thesis Vrije Universiteit Amsterdam, August 1998.